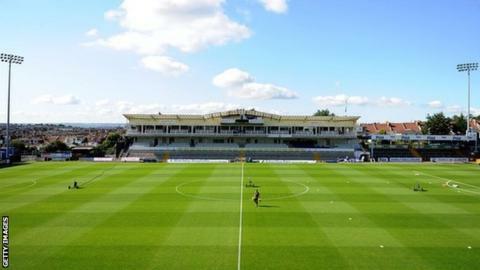 Bristol Rovers non-executive director Colin Sexstone says he is still confident a new stadium will be built. The League Two club are involved in a legal appeal with Sainsbury's over a deal to buy their Memorial Stadium. That deal would allow them to move to a new 21,700-seat stadium but despite losing the original court case, Sexstone is confident it will happen. "There is a lot of work going on behind the scenes, which for obvious reasons cannot be disclosed," he said. "The UWE (University of the West of England) site is still very much there, the discussions are ongoing with Sainsbury's and potentially a court hearing, even outside that there is every chance something could happen. "Looking at the development site and the location of the new stadium it would put them on a different level." Sexstone also said a potential takeover of the club could also negate the need to sell to Sainsbury's. In July Bristol Rovers denied the club has been sold. "There are lots of things bubbling under, a takeover could potentially be one," he said. "It is no secret the board and Nick (Higgs) are looking for other investors to come in. He would only bring other investors in if they can take the club to another level. There is no one particular group, it's an ongoing process." The former Bristol City chairman also believes moving to a new ground on the outskirts of the city will hugely boost the club. "Rovers have had a difficult time and it is amazing that the fanbase has stuck together and that fills you with hope going forward," Sexstone added. "If they can get that new stadium, some people have some doubt but I feel quite confident about it. It will take them to another level and they can be another strong club in the city. "Bristol is a big city of 1.4m in greater Bristol. There is room for two very successful clubs, Manchester is a great example. "New stadiums take clubs to another level and the location of that new stadium is just fantastic, next to a motorway, two stations right there, lots of parking and 30,000 students on your doorstep. "If you can't built a successful club with that infrastructure, you have to question yourself. That is why the new stadium is so important."